Having a new pet in your family is definitely a transition period. You’re both getting used to each other, and your new furry friend is probably unsure and trying to figure out their new environment. This is definitely an adjustment period, and this time can be hard for everyone involved! It is important to make sure you do not lose your temper and work out a strategy to keep your doodle healthy and happy during this introduction and housebreaking period. What are some signs that your dog is acting out? Overactive chewing is a key sign. Now, keep in mind, all puppies chew – it’s unavoidable. The difference is, by keeping an eye on your dog, you can easily stop them when they do decide to get into your shoes or take a chomp on a chair leg. By keeping a close eye on your new pup, you can keep them from chewing what they shouldn’t, making both of you happier. Another example is furniture climbing. Puppies are curious, and they want to see what you, their new friend, is doing sitting on the couch. They want to spend time with you. They will find ways to get up onto that couch to curl up with you, so you need to respectfully and assertively set the ground rules early on to establish good behaviors. However, one of the most important parts about getting your puppy set in a new routine, that can definitely be the messiest if you do not keep up with it – potty training. Some people prefer the newspaper method. Others like crate training. Frequent trips outside are also popular. We elect to use a different method – potty training bells. To start, you need to hang the potty training bells on the door that you use to take your dog outside. They will need to be within reach of your pup’s paw, so make sure that they are hung at a puppy-friendly height. In this next step, your puppy needs to learn to associate the bells with going outside. You will need to use a key phrase of your choosing and then show him or her how to ring the bells with their paw. For this type of conditioning to stick, you need to use the same phrase every time you go outside. It may take a bit for your pup to learn how to tap the bells, so be patient and kind. When starting out, take your dog’s paw and tap it against the bells to teach him or her the action associated with the activity. After a bit, your dog will learn that tapping the bells means they can go outside for a bathroom break. However, it’s important to respond quickly if you hear the bells. Puppies have tiny bladders, and when they have to go, they have to go. Training is a two-way street, and responding quickly when they need to go is the key to success – and a dry floor! At Jubilee Labradoodles, we include potty training bells with each puppy, making it easy for you to get started with this training method. 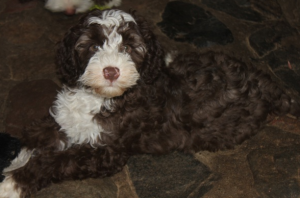 To learn more about house training your doodle or our available labradoodle puppies or goldendoodle pups, give us a call today at 517-467-6811!